Italian pasta and lentils — is said to bring families around the world good luck for the new year ! 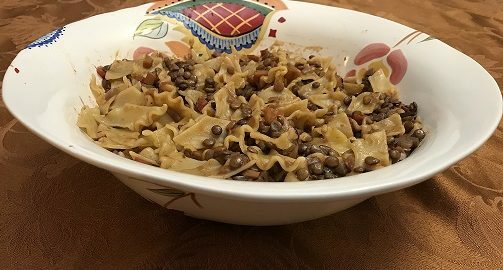 Italian Pasta and Lentils for New Year’s Good Luck! Pasta with lentils or lentil soup is a New Year’s tradition in many Italian households. The lentil dishes are said to bring to luck to the family on New Year’s Day. I am not sure if anyone really knows exactly why lentils are supposed to be good luck. Maybe it is because they are shaped like small coins? Whatever the reason, pasta and lentils is a hearty and delicious winter combination. Lentils are rich in protein, and the pasta/lentil combination was probably an important contribution to family nutrition in the days of the “cucina povera” cooking in Italy. Flavored with a bit of pancetta (Italian peppery bacon), garlic and tomato, the lentils make a delicious sauce that coats the pasta beautifully. 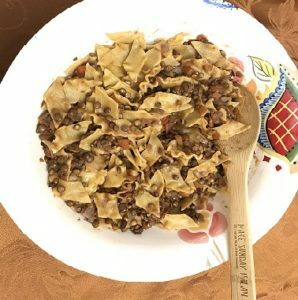 I used “maltagliati” or “poorly cut” pasta for this dish, which to me is reminiscent of its “cucina povera,” origins but also because the lentils cling nicely to the short, flat noodles. If you cannot find maltagliati pasta, lasagna noodles broken by hand into small, irregular pieces will give a similar effect. Before starting to make the lentil sauce, put a large pot of salted water to boil on a back burner. Cover so it will come to a boil quickly and be ready when you need to cook the pasta. Use a large frying pan or Dutch oven to cook the lentils on the stove top. Coat the bottom of the pan with olive oil, which will take about 1/4 cup or so. Let the oil heat a bit over medium heat. Add the chopped vegetables: carrots, celery, onions, and garlic, and saute in the garlic until they soften, about 5 minutes. The pour in the red wine and then bring to a boil. Boil off about half of the wine. Put the lentils to the pan. If you want firmer lentils, you can saute them at this point. Otherwise, add the water. Stir. Bring back to the boil and then lower heat and simmer the lentils about 20 minutes. When the lentils have softened a bit, remove the bay leaf. Then add the chopped tomatoes, tomato paste, and chicken or vegetable broth. Add more water if needed. Bring up to a simmer again and cook 10 – 15 minutes more, or until lentils are of desired tenderness. Meanwhile, put the pasta into the boiling water. Stir. Cover the pot to return to the boil Remove cover, stir again and let pasta cook, stirring occasionally. Cook for less time than the package directions, to a very firm al dente, as the pasta will finish cooking with the lentils. When the pasta is ready, drain, reserving some of the pasta water. Add the pasta to the lentils. Add the pasta water if needed. The sauce should be fairly thick and coat the pasta nicely as you mix. Cook over medium low heat another 5 minutes or so, until all is heated through and pasta is al dente. Add the grated cheese and mix again to coat. Serve steaming hot with crusty bread. Serve additional cheese and black pepper on the side to be added as desired. New Year’s toast: Buon Anno! Buon Appetito! Onions: Cut lengthwise through the onion. Turn one of the halves flat side down. Holding the onion together with one hand, cut lengthwise along the green lines through the onion, except for the root holding the onion together at the base. Turn and cut horizontally, from the side away from the stem toward the stem. Just before reaching the stem, flip the onion flat again and make the final cuts. Discard the piece that contains the stem. The most moist and flavorful pot roast is Italian—and easy to make! Try it for a special Sunday dinner. Try Italian Pot Roast in Barolo Wine for YOUR Sunday Dinner! 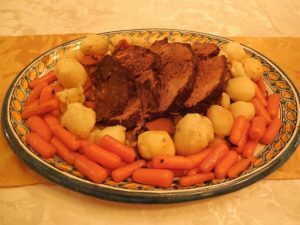 “Do Italians really make pot roast?” I am happy to share not only that Italians do make pot roast, but also that Italian-style pot roast is the most moist and flavorful pot roast I’ve ever tasted! 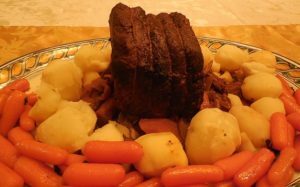 When I lived in San Francisco, I discovered the wonderful way that Northern Italians from the Lombardy region have with pot roast. They braise their pot roast slowly, under low heat for many hours, with a full-bodied northern Italian red wine called Barolo wine. With this method, the meat becomes melt-in-your-mouth soft and delicious. If you can’t find the Barolo wine that is typical of Northern Italy, Barbera wine or any hearty Italian red wine will do. I’ve been making Italian pot roast in red wine for many years now, usually as a special treat for Sunday dinners with my family. The nice thing about the Italian red wine method is that the meat is even more flavorful if reheated; with this in mind, the dish is traditionally prepared the day before serving. Cook the meat until it is almost done, then reheat and finish in about an hour’s time for your special dinner the next day. And don’t worry—there is virtually no way to overcook pot roast with this method! For the Italian pot roast recipe below, you will need a 3 lb. top round or rump round cut of beef. 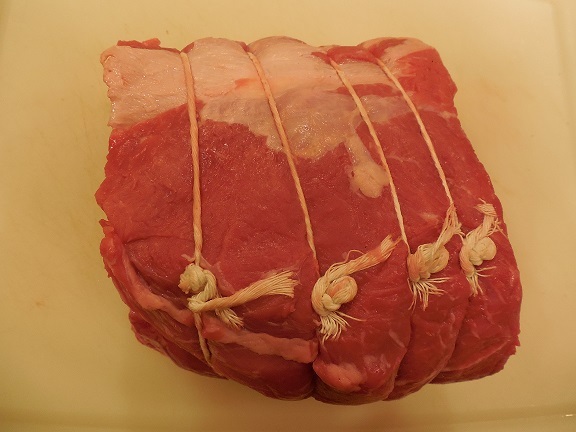 Ask your butcher to tie your meat with butcher’s twine, so the roast will stay intact as it cooks. Or, if you’d like to try to tie the meat yourself, click on the link to a master chef’s video from Le Cordon Bleu. The recipe below also calls for “larding” the meat. This is an old method, whereby salt pork is inserted into tough cuts of meat to yield more tenderness and flavor. Nowadays, salt pork can be hard to find. And although larding is not absolutely necessary, I find that when I use a minimally processed bacon fat—no smoke, salt, or other flavorings added—this little bit of added fat does seem to help keep the roast moist during the long braising time. I have provided below a simple method for larding meat with kitchen utensils found in most homes. If you are interested in a special larding gadget and watching the larding process in real time, click on this video: Tescoma Presto Larding Needle. Of course, you may add a vegetable side dish (contorno) to your pot roast meal. Northern Italy is the home of polenta, which would make a wonderful accompaniment. Small boiled potatoes and cut carrots are also nice to frame your roast when you present it on a serving dish. Prepare your top round or rump round meat by rinsing, patting dry, and then tying with butcher’s twine, if the butcher has not already done this for you. Lard the meat by making holes lengthwise through the roast and then pushing a strip of fat from the bacon through each hole. One of my steel barbecue skewers cuts through the meat nicely and makes a hole about the right size. 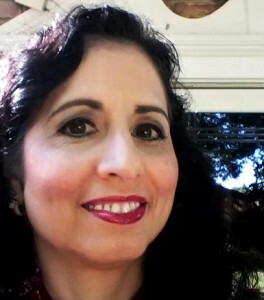 I use my fingers and, if necessary, my knife sharpener or the dowel of a wooden spoon to push the fat through. A special larding device, of course, does the job easily and quickly (see above for the link). Rub the meat all over with the garlic. If you like, make additional small cuts with a paring knife and insert small slices of garlic into the meat. The top round is turned on its end and larded. Small pieces of garlic have been inserted as well. Cut up your vegetables, so all is ready to go before you start to cook. Top round tied, larded, and surrounded by chopped vegetables ready for the pot. When the butter has melted, add the pot roast and brown the meat under medium heat, turning the meat with tongs so that each side browns nicely. 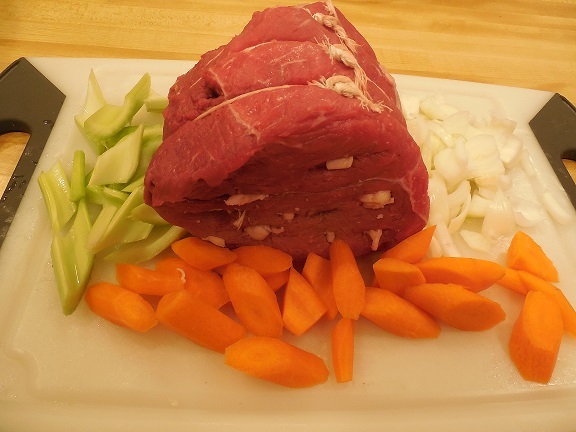 After the meat has browned completely, add the clove, onions, carrots, celery, and wine, with 1 cup of water. If you are making this dish on the stovetop, cover and cook slowly under low to medium heat, so the liquid is kept at a simmer. If you have an oven-proof pan, I find it easier to transfer the pan to the oven and cook at 325°. If you do not have an oven-proof pan, you can move the pot roast from the pan into a pot, but be sure to scrape the bottom of the original pan with a wooden spoon so the liquid contains all of the good-tasting browned pieces from the bottom. Then pour the liquid over the pot roast. The pot roast should cook gently for 3 hours. During that time, every 30 minutes or so, uncover briefly, turn the pot roast gently, and baste it in its juices. After 3 hours, add the tomato paste diluted in 1/2 cup of water. You may need to add additional water to the pot if some has evaporated and the juices become too thick. Continue cooking and braising as above for another 2 hours. The cooking process can be stopped at this time. 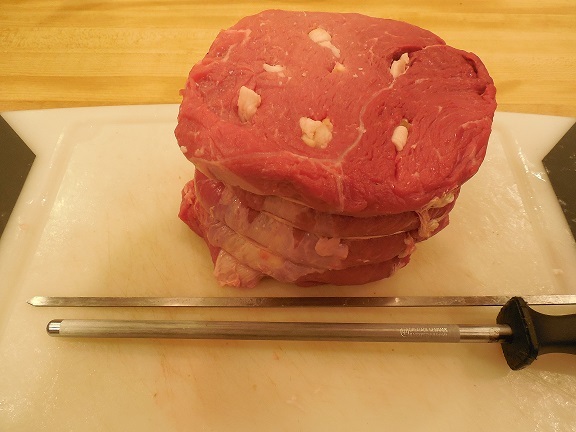 The meat should be tender enough to flake easily when tested with a fork along one of the corners. If not, continue to cook for an additional hour or so. While the pot roast is reheating, prepare your favorite vegetable to go with the meal. Polenta, small potatoes, and boiled or glazed cut carrots look nice surrounding the pot roast, but any favorite vegetable is fine. 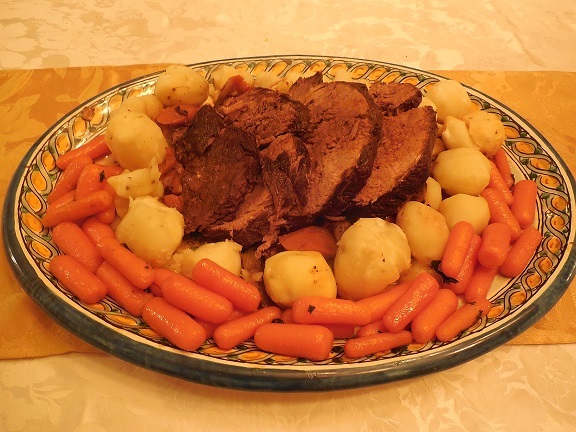 When you are ready to serve, take the pot roast out of its cooking pan and place it in the center of a platter. Remove the twine and cut into slices—before or after presenting at the table. Strain the pan juices, and reserve the vegetables to place around the pot roast. They will look brown but should still have some shape and will taste very sweet. Drizzle some of the pan juices over the pot roast and reserve the rest to serve in a gravy boat.